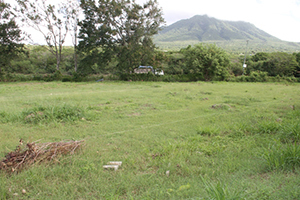 NIA CHARLESTOWN NEVIS (November 06, 2014) — Construction of a new green house for the Department of Agriculture will commence soon. The disclosure came from Minister of Agriculture Hon. 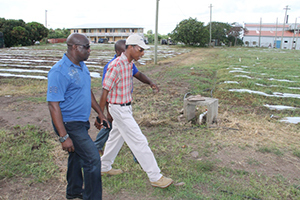 Alexis Jeffers when he toured some government-owned farms on November 03, 2014. According to Mr. Jeffers, the new facility would become a reality at the Prospect Agricultural Station, through financial assistance from the Inter American Institute for Cooperation on Agriculture (IICA) and the Caribbean Agricultural Research and Development Institute (CARDI). He added it would serve to appeal to farmers to employ the new technology. 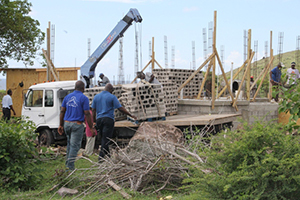 “We are going to use this green house to sensitise the public here on the island of Nevis and potential farmers to get into that type of intense farming. We know land is becoming scarce on the island and that is the type of agriculture that we want to push moving forward,” he said. Meantime, while at New River, Mr. Jeffers explained that a washroom and change facility for field workers was already in progress. When completed, he noted, the facility would provide a better working environment for the workers. The Agriculture Minister also spoke of other steps the Nevis Island Administration (NIA) had taken to assist the welfare of the field workers. “One of the challenges the field workers faced then as against now is that when we came into government, they were indeed deductions being made from their weekly wages which is already meagre and those deductions were made for transportation and the likes. We felt it was certainly unfair to them, after toiling so hard in the field they had to bear the brunt of being transported to the different estates. So that was returned to them…We are trying to make their lives more comfortable,” he said.